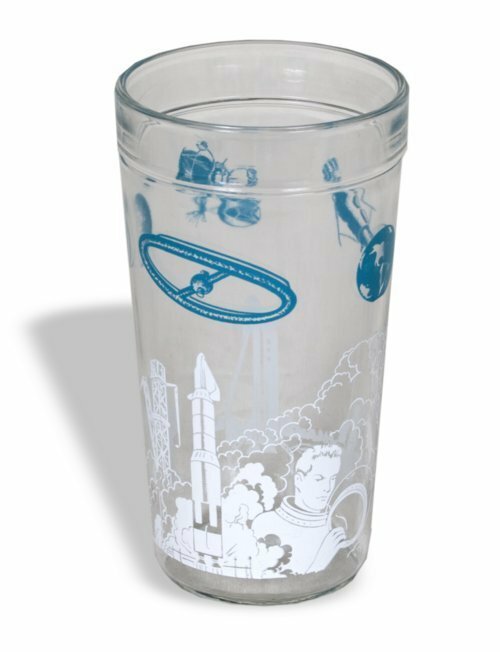 A drinking glass depicting outer space items such as the earth and moon, space stations, satellites, astronauts, a rock and space shuttle. From the artistry and design of the space objects these likely date between 1968 and 1972. During this period NASA was designing a space shuttle (like that depicted) capable of being reused after returning from space unlike the rocket style craft previously used. Throughout the 1960's there was huge public interest in outer space climaxing with the 1969 moon landing.